Cope is my Master’s capstone project completed through the Human Centered Design & Engineering department at the University of Washington. Anxiety can be hugely improved by behavior change, which means it’s a problem space with a lot of opportunity for design! The goal of Cope is to empower users to manage their anxiety by supplementing therapy sessions through timely, personalized coping activity recommendations. Our final solution uses a combination of self-reported data, biometric data, contextual data, and therapist input to do this. The intention behind Cope is to support users in taking proactive steps towards improving their anxiety by developing a better understanding of their triggers and learning what coping mechanisms work for them, which also results in more productive therapy sessions. Anxiety disorders are the most common mental health problem in the US. Access to appropriate care, cost and the mental health stigmas are a few of the many barriers impeding people from finding effective clinical support. With a growing number of people seeking treatment, the traditional therapy model of one-on-one, in-person sessions may not be the most effective way of providing patients with the right tools at the right time. So, we asked: How might we help people with anxiety better manage their symptoms? SURVEY - Received 51 responses from all women, 90% of which were between the ages of 19 to 30 years old. LITERATURE REVIEW - Explored 10 resources with the general themes of: measuring patient outcomes, technology explorations in therapy, and the strengths and weaknesses of therapy. COMPETITIVE ANALYSIS - Analyzed the features of 8 mental health apps and 8 wearables to identify gaps in the market. Uncover opportunities to craft a superior product offering a user experience that is truly addressing user’s largest pain points of anxiety management. Can be triggered by a number of situations and can manifest both physically and emotionally. Can be managed by identifying triggers and effective coping mechanisms, determined on a trial and error basis. Patients that have seen a mental health provider have noticed improvements in their anxiety. Cost, location, access, and finding the “right” provider prevent people from seeking and/or continuing treatment. Patients terminate treatment based on a lack of clear goals, honesty, and/or perceived improvement. Patients have worsening symptoms after an extended period of time without seeing the provider as they are unable to manage their anxiety independently. The traditional health care model of face-to-face patient-provider sessions is not always convenient for people seeking treatment for anxiety. Influence users to adjust behavior by providing information that encourages coping activities. Increase patient self-efficacy by helping to identify and understand what triggers their anxiety. Help mental health providers and patients understand treatment effectiveness by leveraging quantitative data insights that can be coupled with qualitative data uncovered via therapy sessions. Improve treatment plans by providing personalized therapies to patients, at the right time and requiring little effort from the user. Anticipate user needs in order to reduce user interaction by leveraging machine learning to identify and predict stressful situations. We used insights from our research to create three personas which helped us target our designs to users’ specific needs and goals. Our team leveraged the research findings and personas as we generated iterative initial design concepts of what our solution might be. Below are a few of the ideas I sketched/wireframed out and shared with the group during critique. A - In the “Cope” feature the user is first asked to confirm their location and anxiety level. Then they view this game-like spinner, consisting of various anxiety coping activities that are recommended based on data from their wearable and OS. After the wheel is spun, the user can read activity instructions. B - In “Progress,” the user can tab through various data visualizations. Here, for instance, the user can view a calendar showing which days they used the Cope app. Under “Goals,” the user can view goals that were set by their therapist. C - The “Track” portion of the app enables the user to log their locations and activities throughout the day. The intent behind this is to help power the Machine Learning recommendation algorithm. Here, the user can also create thought-log entries and view the treatment plan set by their therapist. Aside from validating our concept, getting feedback, and uncovering any usability issues, our main goal for usability testing was to answer the open questions from our ideation phase, particularly around notifications, goals, coping activities, and features to support anxiety management, as well as integration with other devices. Our greyscale, low-fi prototype supported basic interactions that we tested on an iPhone using the InVision app. We recruited seven participants that aligned to our primary persona. We split our participants into two rounds of usability testing. Feedback from our first three participants was so consistent we opted to make some usability and design changes before testing further. Our last four participants tested with the second version of our prototype. Our participants, people actively managing their anxiety, not only tested the wireframes, but answered some questions for us, as well, which helped demystify their unique experiences (rather than over-generalizing our users’ needs with our personas). Participants saw the most value in: coping activities, the ability to look at data trends, and logging thought journal entries. In later versions of wireframes, I simplified the IA to prioritize high-value features and remove workflows that detracted from the value, in order to help simplify navigation and help users accomplish their goals more easily. 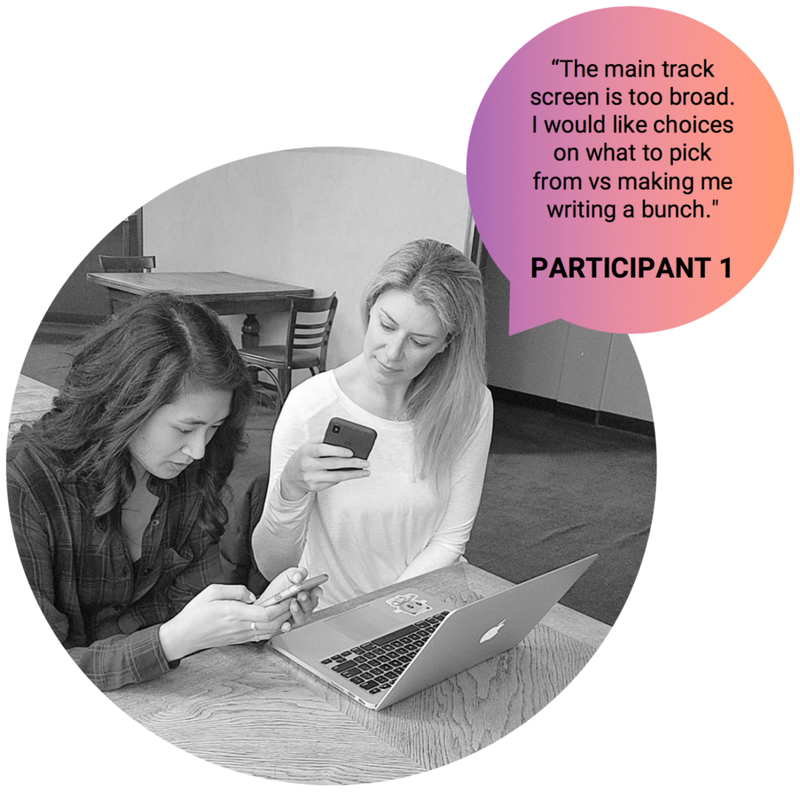 To encourage valuable engagement with the thought log, participants wanted a prompt for their journal entries as opposed to an open text box. They also suggested that ‘tagging’ triggers while reflecting on the day’s anxiety would be interesting when looking at their anxiety trends. To create a more positive user experience, showing results-focused outcomes like progress instead of anxiety-focused trends is a better way of encouraging continued app engagement. Participants wanted our solution to either integrate with an existing wearable and also showed interest in the idea of connecting our solution with voice-controlled assistants like Alexa, but only if privacy settings could limit when and how the assistant interjects with notifications. I independently worked on the visual identify of Cope, incorporating feedback from my group along the way. Cope’s visual language is minimalistic in order to make the workflow and calls-to-action clear and easy to understand, which is especially important when our users are feeling anxious. Following usability testing, I updated our grayscale wireframes to incorporate our findings and design recommendations. From there, I transformed the wireframes (v4) from grayscale to color and leveraged current mobile UX design patterns and trends to help strengthen the user experience. I worked on the final UI designs independently as the lead design contributor. Cope uses machine learning to generate personalized coping activities designed to help users better manage their anxiety. Cope’s powerful recommendation algorithm leverages data from the user’s wearable, mobile device and the user themselves. Cope empowers users to proactively manage anxiety by supplementing therapy sessions with timely, personalized coping recommendations. COPE - Smart recommended coping activities designed at reducing anxiety. Machine learning (ML) algorithm accounts for contextual data such as biometric data, location, time, schedule, etc. LOG - Digital thought journal enabling users to better understand their anxiety. Ability to share journal entries directly with mental health provider. TRENDS - Analytical visualizations summarizing coping activity, anxiety levels and trigger insights. ME - Profile and app settings including the ability to integrate with your mental health provider’s Cope account. Research foundation: our research showed that people aren’t aware of all the different types of coping activities they can incorporate into their day in order to reduce their anxiety. Behavior change is an incredibly powerful anxiety deterrent. Because of this, we prioritized coping recommendations as the core feature of the UX. A - Cope is the home screen of the app. This first UI in the workflow prompts the user to confirm their location, which is pre-populated based on data the app receives from the operating system. B - The user then confirms their anxiety level, which is also pre-populated based on biometric (heart rate variability) data from the user’s wearable. The purpose of this confirmation is to strengthen the machine learning that powers the coping activity recommendations. C - The wheel visualization represents different coping activities -- the user simply taps “spin” to view their coping activity recommendation. D - After the wheel lands on an activity, this UI slides up, providing the user with all the information they need in order to complete the activity. This guides the user and explains why the method will help the user better manage their anxiety. Research foundation: The mental health providers we interviewed recommend that their clients keep a thought journal in order to better uncover and understand the things that trigger their anxiety. The better people can do this, the easier it is to manage anxiety. A - The first UI of the Log feature shows the user a timeline of all their “logs,” or digital thought journal entries. The user can search, filter, browse and read historical entries. B - To create a new log, the user taps the pen icon, which initiates the following workflow. C - Here, the user can either type or leverage voice-to-text to record their reflection of the day. D - This section expands when the plus icon is selected, enabling the user to add comments on how they coped with their anxiety. If the user completed coping activities prior that day, they will be pre-populated in the text field. E - In this final section, the user selects which triggers affected their day. Trigger identification is an important part of demystifying anxiety. The user can also make a selection if they would like to share the log with their mental health provider. Research foundation: Our research uncovered that there is a lack of quantitative data being taking advantage of in the average anxiety-coping journey. Therapists tend to only leverage qualitative data through therapy sessions and our target users keep thought journals… so there is a lot of opportunity here to use rich data in order to provide users with deeper insight into their health and the nature of their anxiety. A - The Trends features visualizes analytics tracked by the Cope ecosystem (data from the app, wearable and device’s OS). The purpose of Trends is to give the user deeper, quantitative insights into their anxiety, which is typically understood only in a qualitative way. B - The “Coping Activities” visualization highlights how active the user has been in engaging in coping activities. C - The “Average Anxiety Levels” graph depicts the trends in anxiety levels over previous months. The 1-5 anxiety metric is used consistently throughout the app. This graph leverages biometric data from the wearable, as well as self-reported data via the app. D - “Scenarios to be Aware of” visualizes what contextual factors are most triggering to the user, enabling them to be aware and make informed decisions.. I worked independently on the interaction design of Cope. I animated the final hi-fidelity prototype in Principle.io in order to showcase a seamless demo that demonstrates the micro-interactions I felt will help engage and excite our users. My team-mate, Layne Soike, created our marketing video, highlighting Cope’s market potential and value proposition. Phenomenally, all of our 51 survey respondents were female, which most certainly skewed our initial findings. We were very surprised by this and if we had more time, we would re-post the survey in other online spaces to capture data from an inclusive sample population. Additionally, we conducted 2 usability studies with our wireframes, however, we did not have time to test our final hi-fi interactive prototype. This would also be a next step if we were to continue the project.